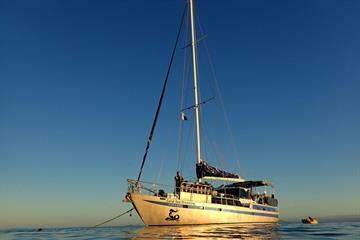 Cairns liveaboard boats will take divers to the world famous dive area of the Great Barrier Reef. 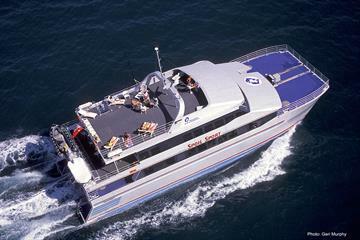 Situated in tropical North Queensland, Cairns has been on the tourist trail for many years. 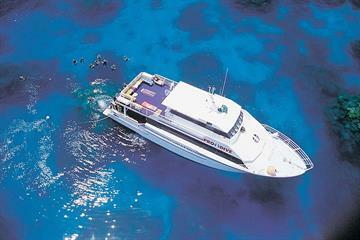 It is considered as the gateway to the Great Barrier Reef, and is the point of departure for the highest number of diving liveaboards in Australia. Originally known for mining, Cairns is known now worldwide for it's easy access to world class rainforests, dazzling snorkelling and of course stunning scuba diving. The city caters for every tourist - you'll find anyone and everyone here, from backpackers hanging out in hip bars, to high flying businessmen docking in the harbour on their private yacht. Inland, it's possible to tour the luscious Daintree rainforest and gushing waterfalls of the Atherton Tablelands. The drive up to Cape Tribulation is well worth it - the point at which tarmac ends and the dirt road begins! The main attraction, however, is the phenomenon that lies off the coast of Cairns - the Great Barrier Reef - and there really is no better place from which to depart for your dive cruise than here. 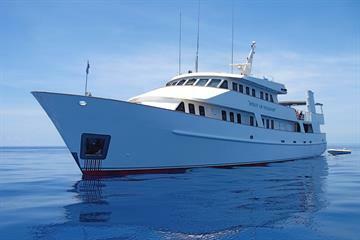 Undeniably the best way to sample the wonders of the Great Barrier Reef is onboard a liveaboard dive cruise. It's possible to visit parts of the inner reef as a day trip, but they are often crowded, and time at each site is limited. Liveaboard diving allows you to be transported in comfort to areas of the outer reef that are frequented much less by tourists, resulting in an experience that will last a number of days and live long in the memory. Scuba diving in the outer sections of the reef will introduce you to some of the most pristine, colourful and healthy corals that you are ever likely to see. The biodiversity of marine life that is supported here is truly outstanding, and as dive cruises tend to last a few days, divers will witness the full array of inhabitants. There are huge schools of small fish, tropical fish spanning the whole colour spectrum, multiple shark species, Manta Rays, Whales, Eels, Giant Grouper - you name it, it's here! The waters of the outer reef are renowned for their clarity, with visibility commonly in excess of 30 metres, and some sites reaching over 60. Water temperature is always pleasant, hovering around 26 degrees Celsius, but ranging from 22 to 30 degrees depending on the time of year. There's a good mix of diving to suit all levels, from calm, gentle lagoons, to exhilarating drift dives. 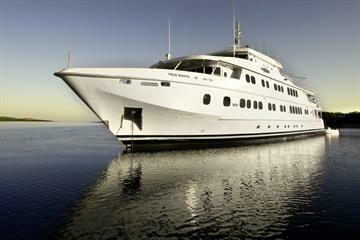 LiveAboard.com has a range of vessels, each offering their own unique itinerary. Liveaboard boats tend to cruise for between 3 and 8 days depending on their route and destinations, which means guests can enjoy their diving but have plenty of time to relax. Each boat features reliable electricity, air conditioning, and a friendly and experienced crew always on hand to ensure your safety and of course enjoyment! Many boats also feature internet - please check this with your operator first though. Cairns is situated some 1700 kilometres north of the state capital Brisbane, meaning that driving here is a bit arduous and unrealistic, although it is very common for people to visit Cairns as part of a wider trip of Australia. By far the easiest way to reach here is to fly. The airport is situated conveniently close to town and is served by a huge number of large international carriers, meaning that most of the time it's possible to fly directly into Cairns from overseas. In the unlikely event you can't, or other parts of Australia form part of your holiday, there are regular daily domestic flights from the likes of Melbourne, Sydney, and Brisbane. 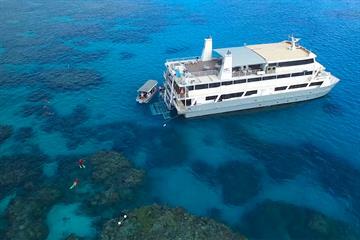 Liveaboard boats are normally docked in the harbour, but diving operators will normally offer a complimentary pick up, and drop off, to/from your choice of accommodation in Cairns.